Standown Park is a peaceful place. 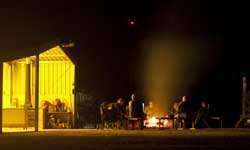 A unique bush camping experience with clean facilities, where all campers, motor homers, caravaners and weary travellers are welcome to pull up a stump and meet your old friends or make new ones. The emphasis here is on friendliness and relaxation where we hope you will feel a part of the place. 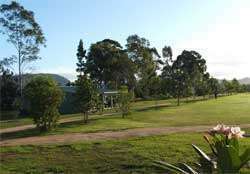 Situated on 18 lush green acres surrounded by the pine forest on two sides and pasture paddocks on the others, the park site has an abundance of trees attracting many species of birdlife. There is ample space for your pet to run and play and the forestry is a beautiful place to go for walks. Your dog is very welcome at the Park, with all the general park rules, ...No dogs in or around the camp kitchen, fire place or amenities; No dog/s to be left alone in or at your van without informing the Manager / Owners of the Park; Always on a lead, no more than 1.5 metres whilst around other campers. Pick up after them please. 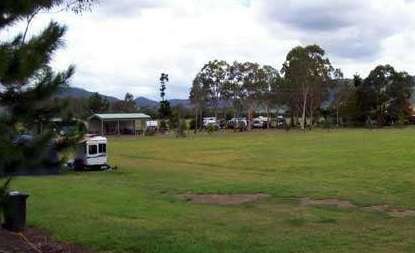 We are just off the Tin Can Bay Highway so the Park is secure and with the picturesque mountains in the near distance, it is the ideal place for you to park your rig and rest while exploring the many attractions of the area. $6.00 per extra person 5 years and over. Situated half way between Gympie & Tin Can Bay. 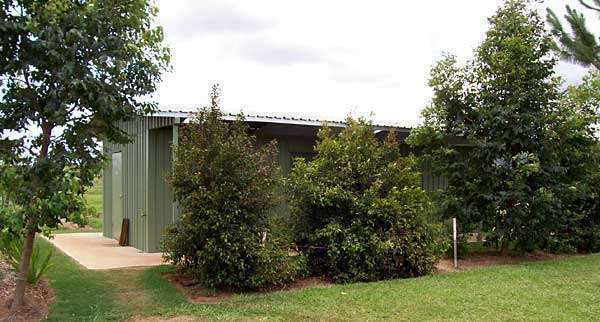 At Standown Park we have 28 spacious powered sites all with excellent drinking water and unlimited unpowered sites with ample space for large groups or clubs. 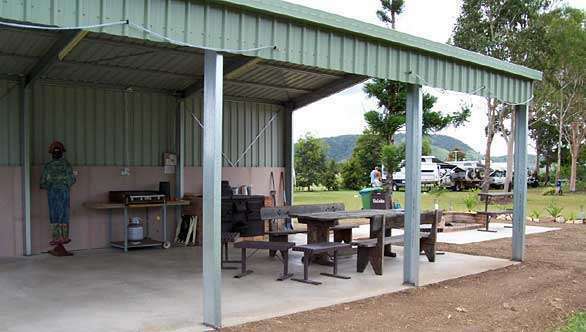 The large camp kitchen featuring the big old Crown wood stove and BBQ is the central meeting place for all, while the open fire place is a popular spot each evening for 'Happy Hour' or two.The clean, modern amenities block has male, female and disabled facilities and a coin washing machine and dryer. A dump point was installed recently for the convenience of the park visitors and to the public for a small charge.Telstra and Optus reception is very good and TV reception generally depends on your equipment and the site position in the Park.Pets are welcome, with plenty of open space to exercise the dog/s and they are welcome to swim in the dam.As we originally set up the Park as a Veterans Retreat we have continued to cater especially for the Veteran's from all conflicts and the travelling 'nomads'. We don't have any facilities for children.